The Ganpati festival is a grand affair at actor Salman Khan's Galaxy Apartment every year. 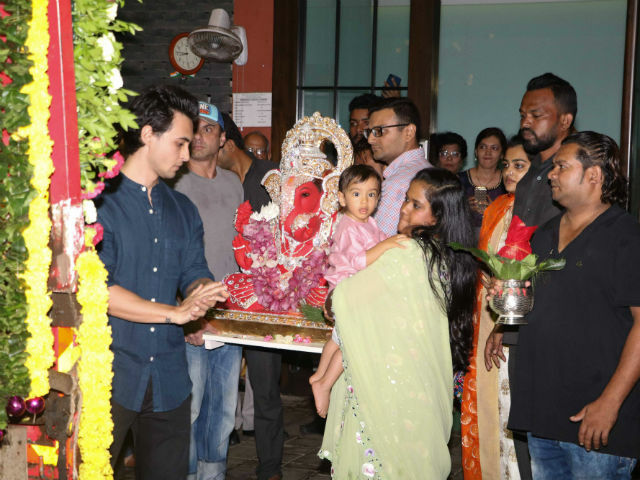 However, this year, Salman's sister Arpita Khan Sharma hosted the Ganesh Chaturthi celebration at her new residence as the actor is busy shooting for Ali Abbas Zafar's Tiger Zinda Hai. On Saturday, the Ganesh visarjan ceremony took place yesterday at Arpita Khan Sharma's residence at Mumbai's Carter Road which was attended by Salman's rumoured girlfriend Iulia Vantur, Arbaaz Khan's ex-wife Malaika Arora and her sister Amrita Arora, Sohail Khan, Helen, Juhi Chawla, Sophie Choudary and Swara Bhaskar. 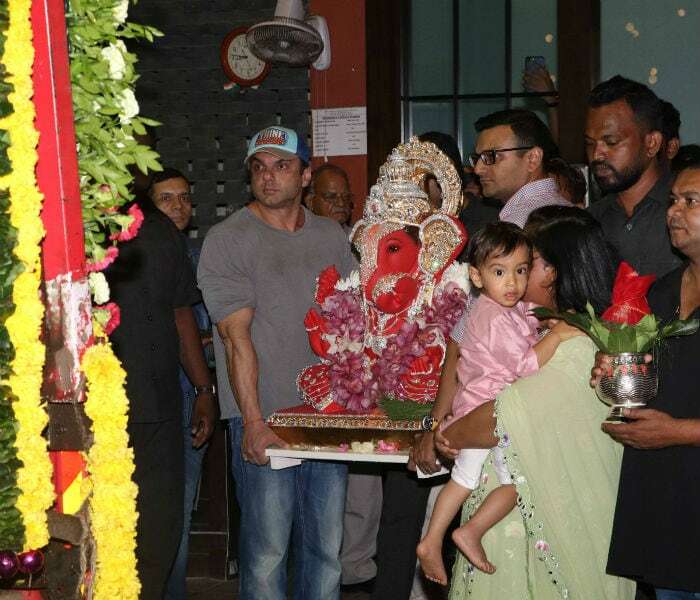 Arpita's husband Aayush Sharma was seen carrying the Ganesha idol outside their residence. He was followed by Sohail Khan, who carried the second idol. 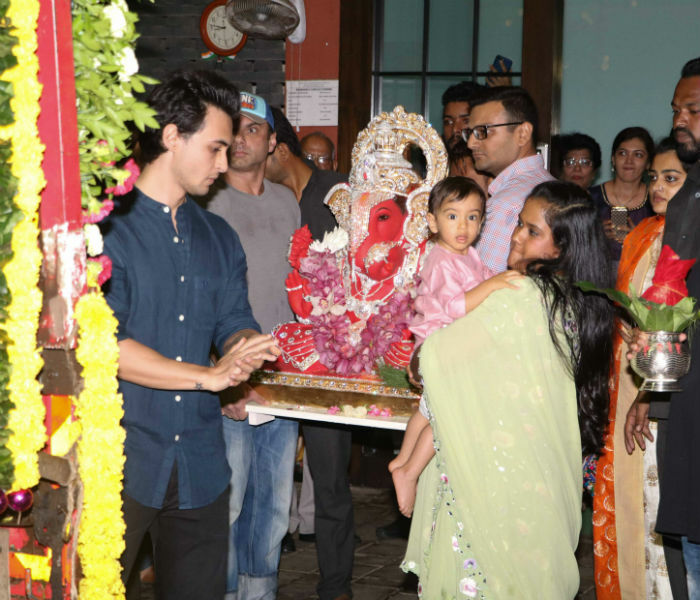 Arpita and her son Ahil were seen standing beside them, enjoying the festivity. Posing away @malaikaarorakhanofficial @amuaroraofficial @iamarhaankhan Ganpati celebration ! Iulia Vantur looked stunning in a light green suit paired with a pink dupatta. She smiled for the cameras. Malaika Arora looked beautiful in an outfit designed by Sohail Khan's wife Seema, while Amrita wore a pink outfit by ace fashion designer Ashley Rebello. The sisters happily posed for the cameras. 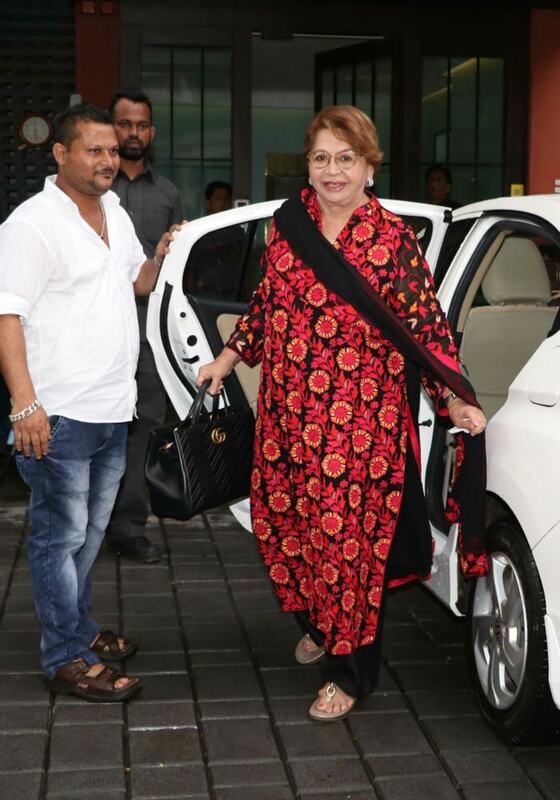 Here are the other Bollywood celebrities who attended the Ganesh visarjan ceremony at Arpita Khan Sharma's residence. Salman Khan was missing from the celebrations on Saturday but the actor attended the Ganesh Chaturthi celebrations at his sister Arpita Khan Sharma's Carter Road home on Friday. Ganesh Chaturthi festival began on August 25 yesterday. The 10-day long festival will end on September 5.